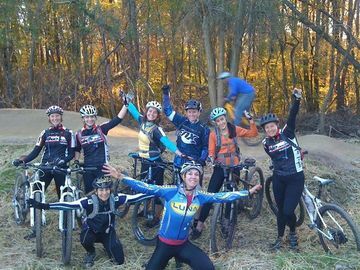 Also called the "Candy & Confidence Ride"
Join us for a girls' ride from downtown Baltimore to Patapsco State Park & back. Total riding time will be about 3+ hours, half on the road, half on the trails! Mountain bikes are recommended, but any bike will do. During the ride, we'll talk about riding safely and confidently in the city streets, as well as proper body position and safe riding techniques for the dirt. Feel free to join for the road portion on your road or hybrid bike at 8:00, or meet us just for the trail part at 8:45 AM at the Park N Ride trail head at Patapsco (on Rte 166). Of course, skirts are optional, and guys are also welcome! P.S. & bring some candy if you can- the most interesting candy wins a special prize!